Let O’Nealgas help you take advantage of the benefits, comfort and savings offered by propane. We offer a full range of propane gas equipment, including many top-performing brands designed to help you get the most out of clean-burning and efficient propane, both indoors and out. We sell and install just about any propane appliance on the market today. Additionally, we offer a comprehensive line of electric appliances. From heating to lighting to cooking, we can help you enjoy the full power of propane. 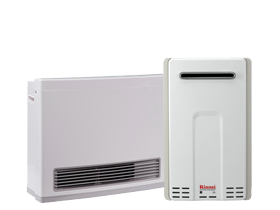 Rinnai, a leading manufacturer of propane-fired products, is currently offering a special promotion: up to $100 off the purchase of qualifying Rinnai tankless water heaters. With Rinnai’s superior engineering, smart design and unmatched quality, you’ll enjoy an endless supply of hot water—plus significant energy savings, all year long. This offer valid while funds last—so don’t miss out! Contact us for more information today. We offer competitive pricing and expert installation and service. When it comes to propane, we truly have your gas and equipment needs covered—inside and out! Contact us today for advice and great pricing!